This is not a prize for good painting. That's what the best picture award is all about. However I do expect the overall quality of artwork on the blog to be good. This is a prize which rewards consistent output. It's about artists who have the discipline to practice their craft and post on a very regular basis and deliver and maintain good quality in terms of interesting paintings. It's no longer about posting every day - but it is about posting a lot of paintings. If you do post every day, it is noticed. It's never awarded to people with new blogs - because the capacity to continue posting wears off after time for a lot of people. Stephen Magsig - Postcards from Detroit - nominated by David J Teter and me. David said He consistently posts (nearly) every day. Stephen's work continues to not only document the industrial and urban areas of Detroit (as well as the occasional random subject) but also is an artists mirror reflecting the current state of our economy and the effect it has on our cities, businesses and neighborhoods by frequently showing the closed down, boarded up and graffiti tagged facades of buildings. A subject a lot of artists shy away from and outside the realm the 'pretty' pictures. Jonathan Aller - Alla Prima Studies nominated by Jim Serrett who said His work is consistent and professional and done from life, “no paintings from Photoshop here”, just the real thing. Gillian Holding - #adailyselfreflection - nominated by me. I liked this project a lot. It mixed up photography, painting and drawing to create a daily image using digital means - including apps for iphone and ipad. It didn't quite last the distance but I decided to include it as a nomination here because I applaud its innovation. (Maybe I ought to have the David Hockney Award for regular digital postcards next year?) #adailyselfreflection began when I realised there was a great forum in cyberspace for showing digitally generated work, and I loved the idea that artwork with no tangible existence could be viewed in the exact form in which it had been created. Oriana Kacikek - Paintings by Oriana Kacikek - nominated by me - What can I say - I'm very fond of artists who paint food. It's also really nice to find somebody who realises there are alternatives to a PB&J when painting sandwiches! Very nice paintings - however I'd have to find an easier way to review more of her paintings before Oriana is in with a serious shout of this award. The explanations about might make it seem like Stephen Magsig gets this award by default. Nothing is further from the truth. I wrote his name down first - and a long time before any others came along. Here's why. He's doing something unique and worthwhile. I totally concur with David J Teter's rationale for nominating Stephen. He also provides something of a role model for the way in which you can convert the asset of regular daily paintings into other products for sale to those who want to collect artwork. Sometimes the "stickability" runs out before those conversions get made - but not with Stephen! Postcards from Detroit is an interesting spin on the better known one which emanates from Provence and is a relatively new blog which started in August. 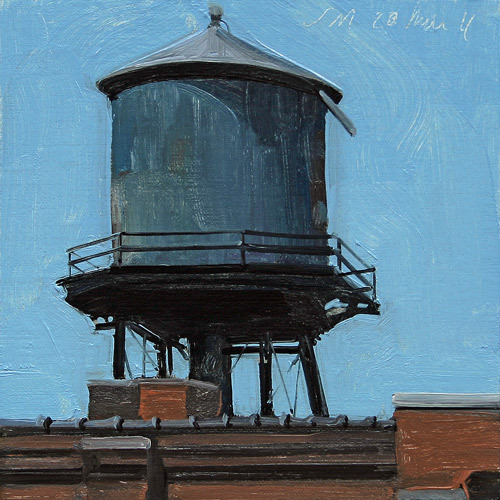 Stephen Magsig is based in Michigan has been doing daily artwork since 1987 - and it shows. When writing my post about Make your own art! I started to look around at daily painting blogs to see who was being unique, original and not painting the ubiquitous fruit. One such blog is Stephen Magsig's Postcards from Detroit. As well as painting on a regular basis, Stephen is also doing something which is culturally worthwhile - he's documenting a city which is undergoing significant change. It adds value to his work. Here are all the places where you can see Stephen's artwork. POSTCARDS FROM DETROIT Postcards from Detroit is a visual diary of Detroit in small daily oil paintings. Most of the art projects to date have involved very significant numbers of artists. One of the things I've noticed in 2011 are the group art blogs being created. It seems as if the main purpose is to create a social record of mutual activity by a small group of artists rather than to attract an external audience per se. I'm beginning to wonder if people are realising that the demands of the mega projects are such that there's a limit to how long they can survive unless there's a very clear commercial imperative associated with one person putting in the time and effort. Certainly if just one person runs the project it can rapidly becomes too much and eat into their time for their own art-making. It's very evident that for bigger projects, part of the trick in achieving longevity is to identify a small group who can manage the whole project and any spin-offs. It's also possible that Facebook has created an alternative host for group efforts. I think it's a pity if that has happened because not everybody likes Facebook and also most of it is inaccessible unless you are a member. Hopefully readers will find the reasons why these are "near misses" are to be instructive. Natalie Italiano for One Hundred Alla Prima Portraits of American Teenagers - nominated by Penny German. This isn't really eligible as the purpose of the award is to focus on a collaboration between a group of artists. One Drawing a Day - I was minded to nominate this site until I found the blog took an age to load. Possibly because there's no limit on the size of images which can be uploaded? Hence I've not been able to look at it as much as I'd like. The Art Project - Google's massive project to digitize the insides of museums around the world is very educational - but it isn't an art blog and doesn't involve art bloggers in any way. Pity! Artists of Texas - I've been very keen for some time on group blogs which demonstrate collaboration and co-operation between artists in a specific area (it's the online version of open studios). Unfortunately it's difficult to find good ones which demonstrate lots of blogging and bloggers and staying power. This one does, however this "art blog" is actually the front end of an international commercial online gallery operation which is attempting to syndicate an identical model for lots of different groups of artists and requires a subscription to join. The commercial aspects and subscription fee are not an issue as such - it's the lack of a unique and independent identity which ruled this one out in the end. ALSO This is NOT an art blog project. However it would be remiss of me to fail to give a special mention to Dan Thompson (Artists and Makers) who runs a Revolutionary Arts online arts magazine and promotes the constructive use of empty shops by artists/musicians. In August, he initiated the #riotcleanup in the UK via Twitter - one of the most successful group activities this year. Just goes to show what can be achieved when a creative person imagines positive uses of Twitter and the Internet! Women painting women - nominated by me. "Women Painting Women" explores how contemporary women painters are handling women as subjects. The blog was founded by Sadie Valeri, Alia El-Bermani and Diane Feissel and features various paintings by women of women. It's a small scale project and there aren't a lot of posts however it has a very clear focus and it's always a pleasure to look at. A Postcard from My Walk - nominated by me. Doing a postcard every month is a bit easier than producing a painting every day. The idea behind this blog is that every month a postcard would be created while undertaking some form of exercise and then sent around the world to another member of the Sketchercise group. Although I participate in this, it succeeds because of Ronelle's organisational ability (and slideshows) and the whole group's commitment to keeping those postcards winging around the world for a whole year. It's also upped the standard of artwork which we find acceptable to send! The Help Japan Challenge Auction - This was organised on the Daily Paintworks site and involved a lot of art bloggers contributing artwork to raise funds via an auction to help those affected by the Tsunami in Japan. The challenge was created by Keiko Tanabe and David Marine of Daily Paintworks hosted it on the Daily Paintworks website. To date, art to the value of $29, 218 has been raised as a result of the sales by the very many Daily Paintworks members /art bloggers who took part. This is a model of contribution which we've seen many times before - however I don't think I've ever seen one before which was up and running and selling quite so fast and to such good effect. In terms of level of involvement of art bloggers, capacity for adding value and overall impact to my mind there's no contest as to the worthy winner this year. This is a new prize this year and hence there is no list of previous winners. blog posts are timely eg post about the exhibition in good time for people to arrange to visit! images are very important - and should be included whenever possible and relevant. 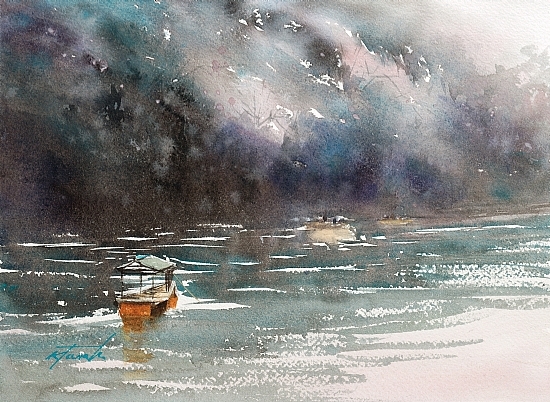 An art society blog without images says something about how important they really are! This was the main reason why art society blogs were NOT shortlisted. Artists of the RI - This is a new blog this year but it's made it past the 3 months mark and is still delivering regular if infrequent blog posts. I like the way it's focused on providing a perk for the artist members of the Royal Institute of Painters in Watercolour who are getting an opportunity to profile who they are, what they do and what their artwork looks like. This is one to watch for the future. The Royal Institute of Oil Painters Blog - Great use of the popular posts widget by the ROI Blog to highlight the posts which have interested both members and the general public. Anything which helps to make content more accessible is good. The blog is being used well to cover the full scope of society activities and the activities of its members eg independent exhibitions. This blog was created in 2010 and has been coming on in leaps and bounds during 2011. Content is strong and images are everywhere! 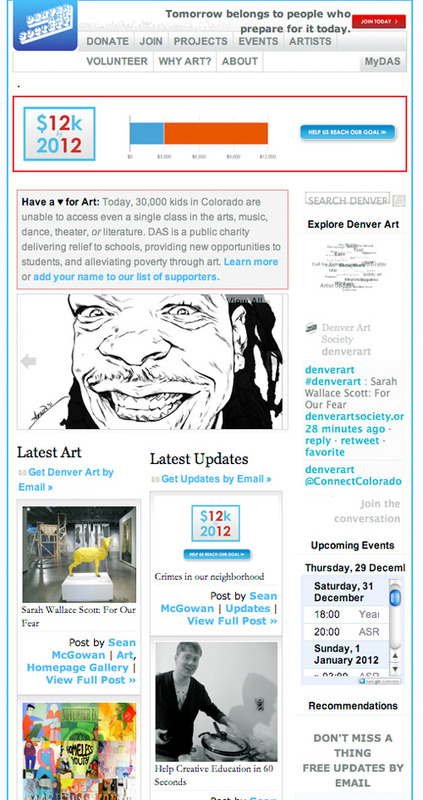 Denver Art Society has a combined website and blog. I strongly suspect it might be more accurate to call it a blog with static pages. However achieved it combines the essential static information pages which most societies have with two separate streams of dynamic pages which update on (1) the latest news and (2) regular artwork on display or being produced by artist members. The Home Page constantly updates with a layut which places priority on the dynamic content and the twitterstream and a schedule of upcoming events. However I thought it's most impressive aspect was the very vocal commitment to universal access to an art education and the scope that art has to play in maintaining a healthy local community. This is a reenergising art blog belonging to an art society which aims to kickstart a creative renaissance! We believe universal access to a strong arts education is essential to creating and sustaining a healthy society. The Denver Art Society’s mission is to organize independent artists and provide venues for the development of creativity. The Denver Art Society site opened my eyes to what can be achieved in terms of dynamic content, design and the scope for a society to have a very strong connection with its local community. The next post is about Getting out of the Studio. Wow! Thank you, Katherine, so much for the mention! I was thrilled to see my blog up there, and very much appreciate your comments! In fact, I should just clarify that I did achieve what I set out to do which was to blog a self-portrait a day for a calendar year; just so happens my year began in a September! It proved to be an extraordinary experience, but after a year, I thought it would be interesting to have a go at a new project on the blog, and after casting around for a few ideas, I started the new project today. It's very different, but in many ways just as self-revealing. I do like to take myself out of my comfort zone!